2018: In her first AVP main draw, Sponcil and Lauren Fendrick finished second in Austin. The duo played two other AVP tournaments, then Sponcil partnered with Terese Cannon for a pair of AVP events. In their debut together, Sponcil and Cannon advanced from the qualifier and won five matches in the contender's bracket to reach the semifinals. Sponcil led the AVP Tour in digs (6.08 per set). 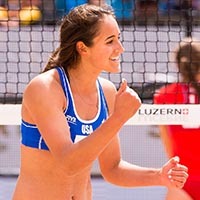 On the FIVB Tour Sponcil played once with Caitlin Ledoux, winning a bronze medal in a three-star event. She then played three times with Fendrick, getting a best of fifth. 2016: Sponcil and Torrey Van Winden finished fourth in the FIVB U-21 World Championships. 2014: Sponcil and Alic Eager finished 37th in the FIVB U-19 World Championships. 2013: Sponcil made her beach volleyball debut at the age of 17, finishing 17th in Huntington Beach with Susannah Muno, losing 19-17 in the third set of the match to qualify for the main draw. College: Sponcil played indoors at Loyola Marymount, where she was the 2016 West Coast Conference Defensive Player of the Year and the school's Female Athlete of the Year. In three seasons at LMU Sponcil ended ninth all-time in kills (1,193) and helped team to 2014 NCAA Tournament and 2015 Sweet Sixteen. She transferred to UCLA for her senior season and was a setter for the team which advanced to the NCAA Regionals. Sponcil also competed in beach volleyball, helping the Bruins to its first ever NCAA Championship in May 2018. Personal: Sponcil, who has one older sister (Rebecca), led her high school team to three state championship titles plus a runner-up finish. She was the Arizona Gatorade Player of the Year in both 2012 and 2013.